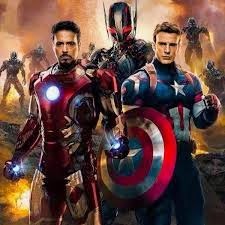 We can agree that director and writer Joss Whedon had done a brilliant job of coordinating the cinematic Marvel Universe efforts, both amazing--Iron Man, Captain America:The First Avenger--and lackluster (Thor) so that that they all lead up to the gloriously noisy, jokey, jivey, dynamic and breathtakingly awesome Marvel's Avengers movie. This was a magnificent first movement in a plan that is said to be composed of three different phases of how Marvel comics plans to bring their comic book characters to the big screen and much smaller streaming device. Action, insults, just enough dramatic interaction between nominal heroes, hammy performances by central villians and, true to the Marvel comic book heritage, a devastation of a good part of New York City while good guys and invading aliens battle one another. Now what? A full blown, energetic sequel, of course, but this is where the momentum leading up to the Avengers goes slack. There are quite a few critics who see this as an inspired and vigorous follow up to the triumph that was the first film, but much like Spielberg's Indiana Jones and the Temple of Doom, his follow up to the wonderfully scatter shot chase that was Raiders of the Lost Ark, the premise of this film seems more asea and improvised through second guessed rewrites rather than making us think of a true adventure where the labors of the good guys lead to some sort dynamic justice being applied. Matters are handled well--Whedon is one of those film directors who understands comic book action sequences and, of course, has a handle on the sort of characterizations make up a typical Marvel hero--but the second act of this ongoing melodrama lacks real purpose. It arises more as a need to add more zigs and zags in the ongoing battle to make all the Marvel movies a unified film reality where different franchises can convincingly mashed together. There are wonderful set pieces, and the final battle concerning an elevated European city has some genius to it, a wonderful combination of special effects, editing and pacing. Still, I sense much huffing and puffing and frantic, hurried chatter coated in faux-science jargon to insert another plot twist, another impending danger, and then the assembled heroes scrambling into action, from place to another, trying to rescue civilians, quell disturbances, defuse doomsday machines, the whole sink. The sense of let down is inevitable, I guess, when it comes to sequels--Godfather 2 was an exception, truth be told--but bear in mind that Avengers:Age of Ultron is worth seeing. It's fun, it's noisy, it has that "wow" factor. In all, not so bad. But not as good as you want it to be.